April | 2013 | That Was an Accident! It hasn’t been long since I made the little guild for myself, my alts and the alts of friends, and it’s nice seeing a guild “progress” in non-raid ways. Since I’ve always been in almost max-leveled or completely maxed out guilds before, it’s almost like participating in some formerly forgotten tradition that’s been recently revived. I like seeing the little guild experience bar actually going somewhere. So far, we’ve made it almost to level 3, and I managed to create a tabard that nobody really hates for “Everybody Needs a Logo.” This was harder than it sounds – a lot of logos don’t look so good on characters who have bewbs (or exposed spines, for that matter). Now, a month later, little Termina is level 11, thanks to friends dumping leveling alts in it. Mass Resurrection may still be a distant hope, but dude, we have mobile banking! Hotness! In addition, I’ve successfully resisted the temptation to change the tabard to hot pink with a funny symbol, and we’ve gotten up to five bank tabs, which are of course not enough space given the amount of crap we collect. (I mean, come on! What if we NEED all three of those Ebonhold belts for a guild RP uniform or something? THINK ABOUT THE FUTURE, JEEZE.) I also haven’t been able to give in to my renaming itch, mostly because I want to call it “Wrath of the Burning Pandaclysm,” which is too long. WoBP just doesn’t have the same feeling. While most members of Termina have invite capabilities, I’m usually the only person doing the inviting. I only invite good friends who have been around me for awhile (we’re comfortable in each other’s company and there’s no drama), who are generally all around awesomeness and don’t mind donating low level alts to feed the guild experience monster. It really is a purely social guild comprised solely of people I know and appreciate. 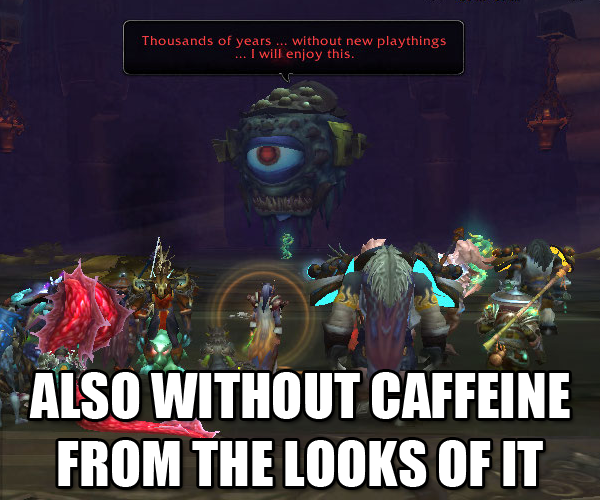 Unfortunately, given real life and other assorted WoW obligations, it can be quite quiet at times. I like having a close circle of friends, but I also like having an “intermediate” or larger circle with a shared cause but who aren’t as close – and that ring seemed absent. I also wanted to be able to pull off transmog runs in the old-school-but-can-still-kill-you raids that Termina just doesn’t – and probably won’t – have the bodies for. There’s no doubt that when it comes to transmog runs, we can become very focused and can take on a lot of sheeyit by ourselves. Buuuuut sometimes, you just need an off tank. Unfortunately, the other one you know is totally raiding right now! 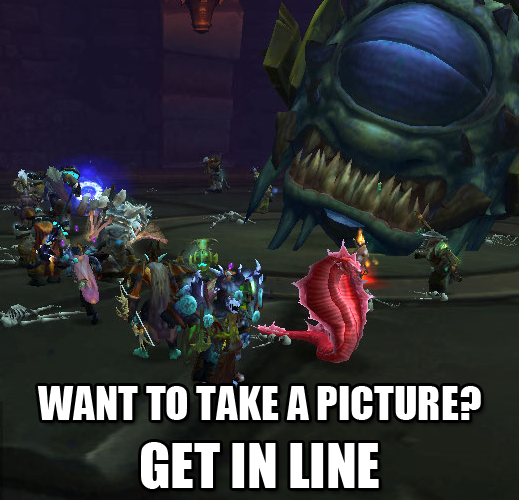 Or you need more DPS, but s/he’s doing LFR with the other guild, or may simply be offline. Or you need a healer who doesn’t run around spazzing because OMFG WHERE DID ALL THESE ADDS COME FROM WE’RE DYING OGOD and/or JEEBUS TAP DANCING CRIPES THAT DEBUFF OH YOU’RE DEAD THAT’S BAD HELP MEEEEEE OH WAIT YOU’RE DEAD. 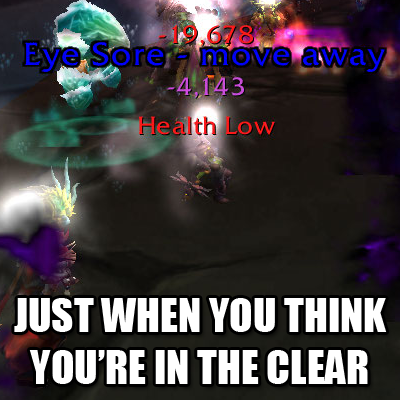 I’d tell myself, “That’s why you heal all the things faster,” but we wiped so now it’s kinda pointless. Can you two man Patchwerk on Naxx 25? Not if I’m healing! Check one off the list! Therm happened to join her new guild on a day when they were doing transmog runs. Good sign, yes/yes? This entry was posted in For the Horde, Baby!, Goblins, Thermalix, World of Warcraft and tagged goblins, guild, oh the goblinity, thermalix, world of warcraft, wyrmrage razor on April 30, 2013 by Prinnie Powah. I was thinking out loud the other day when I mentioned that Vi is, at long last, about halfway to being able to afford the fastest flight skill. Cal made a point that if I hadn’t abandoned a “certain Shadow Priest” awhile back and could pick ONE darn main, I wouldn’t have this problem with being broke! Background here: Ailabeth was the first character I made upon restarting WoW in 2011, and the one I chose to level to 80 when I came back to the game in 2012 after an extended absence, buuuuuut I then deleted her in a fit of “I DON’T WANT TO LEARN HOW TO HEAL AGAIN!” This was stupid, since I just recreated, releveled and reproffed (yes, that is now a word) her from scratch – twice. I will sometimes play a particular character for large chunks of time (particularly if I have a transmog goal that requires leveling), but no one class has ever really been THE CLASS for me. Yeah, there are some I enjoy more than others, but I never completely sync with any specific rotation (there are too many other buttons to press! ), general style or even armor type. Most DPS classes appeal to my independence and are useful for those hours I play when no one happens to be online, but I never feel particularly effective as a DPS when in groups. This is problematic because I always want to be helpful, especially when I’m playing with friends and/or we’re stuck on a boss in a raid, because people are always thinking the problem is me. But I often suspect that improving my DPS further is a somewhat hopeless cause as I also like try the other roles out, and thus can’t pick a button order to memorize main to save my freaking life. You also can’t forget the eternity a DPS will most surely spend in the LFD/LFR queue (it’d be edifying if you could not only see your played time, but also see how much of that was spent in a queue). Speaking of pugs, the fact that pretty much no one cares what you do as long as you don’t get everybody killed is sad, though it IS nice to be able to coast when you want. Also, I really don’t care for the DPS numbers game. 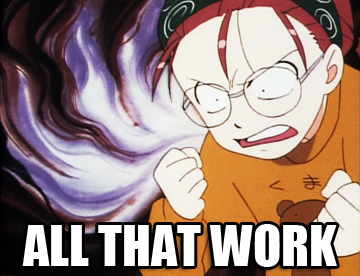 STOP QUOTING RECOUNT AND JUST KILL ALL THE THINGS, GAWD. Tanking appeals to my “take charge and charge the hell ahead” nature, as well as that sort of fatalistic sense I’ve got that the only way to get things done right is to just do it yourself and get it over with. 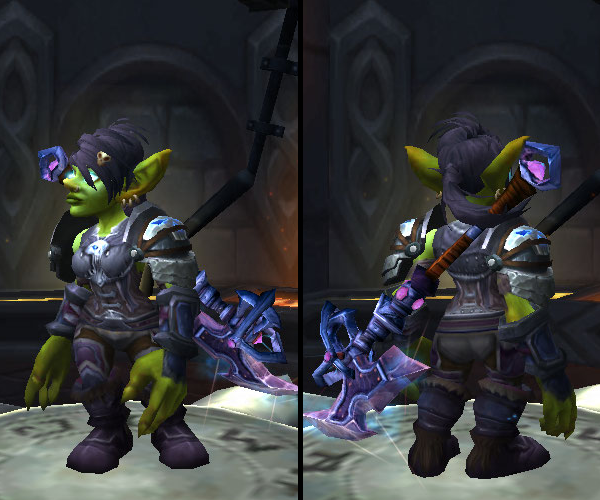 I find plate hard to mog and goblin ears usually look moronic with helmets. Though I haven’t tried tanking on a DK yet, Mechalis is putting together a tanking set that is approaching the LFR gearscore barrier, and heroics are certainly within the realm of possibility. Still, putting myself in front of such a large (and snarky) group is about as appealing as stuffing cheese in my ears. There are also those times when you just want to log on and mindlessly follow the leader, but that’s a little hard to do when you ARE the leader. Healing appeals to my moral side, since I do enjoy “accidentally” letting karma take effect if I feel somebody Seriously Need a Lesson, but healing seriously effs with my inner performance perfectionist when people die and I didn’t want them to. Otherwise, if something doesn’t chow down on me, thereby aggravating my Sense of Futility, it’ll be awhile before I can kill it in revenge, which aggravates my Sense of Impatience. About the only thing I have a clear and definite preference for is the goblin race. So how DO you pick a main? If I pick one, I then lean towards another. If I spend a lot of time burning up all the things as a warlock, then I will inevitably see another hunter with an awesome pet and decide that I must tame it, or that I could tank better than THAT, for Gawd’s sake. 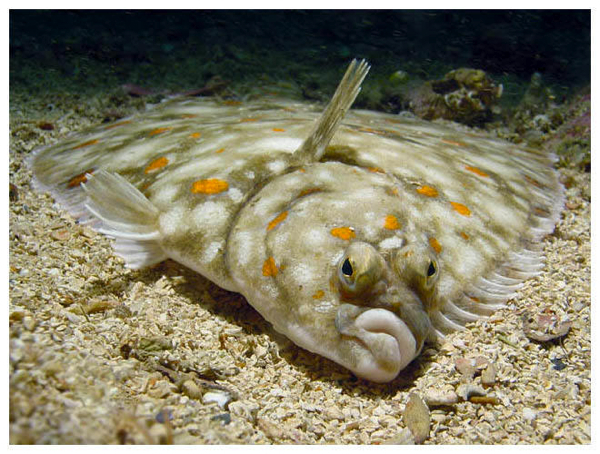 If I tank a lot, I go through phases and eventually dissolve into an ooey gooey puddle of person that is only capable of button-mash style DPSing for a period of time. If I go by gearscore, I end up confronted with the fact that EL OH EL YOU HAVE NO LUCK AND WILL NEVER HAVE A SHINY WEAPON and DAILIES FOREVER, which is depressing. Maybe I CAN’T play just one. This entry was posted in World of Warcraft and tagged halp, maybe someday will be better, oh the goblinity, that's probably not good, world of warcraft on April 25, 2013 by Prinnie Powah. So I just moved over the last week, and in the process I apparently lost my transmog notebook. I wrote out ALL my ideas in it – all the pieces for each set, where to get them and what they cost, whether it be Justice, or Honor, or blood, or tears, or souls, etc. I wrote a concise list of dungeons and/or raids that each character needed to run so that I could check it at a glance. Aaaaaand it seems to be MIA. All that work for intangible nothings has become nothing, which seems a little extreme. I am bothered by this. Is it a sign of a transmog addiction? This entry was posted in OMGWTF, Transmog, World of Warcraft and tagged /omg, maybe someday will be better, oh the goblinity, transmogging, world of warcraft on April 21, 2013 by Prinnie Powah. When I think of Pinnacle of Storms, the first thing I want to know is if Blizzard REALLY thought that name through. On the one hand, P.O.S. is perfect because you will die and your gold will disappear and so will your faith in humanity. On the other, that sort of acronym showing up at the last, supposedly most awesomesauce place is kind of awkward. Let’s start with Iron Qon, the guy who reminds me of mount collectors. He has TOO MANY mounts and he can’t choose just one of the bunch, so he shows up with three in his hotkeys. 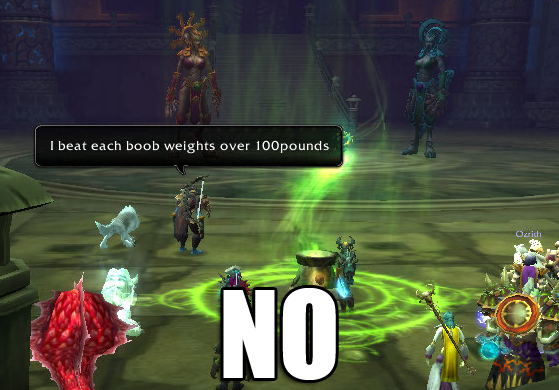 (He hasn’t learned those fancy macros where you can bind more than one mount to a button.) Anyhoo, the LFR group helps Qon make a decision by killing the crap out of each one of the elemental Quilen he has. Eventually, when you run through his entire stable, he’s forced to fight you on foot. I’m sure he cursed every second of it, like how I do when I really want to fly to avoid aggro because I need to get someplace, but I can’t, because Blizzard wants me to see the world. As it turns out, you DO need two tanks! Go figure! Here’s the thing, though. Right before the fight, one of our two tanks dropped. 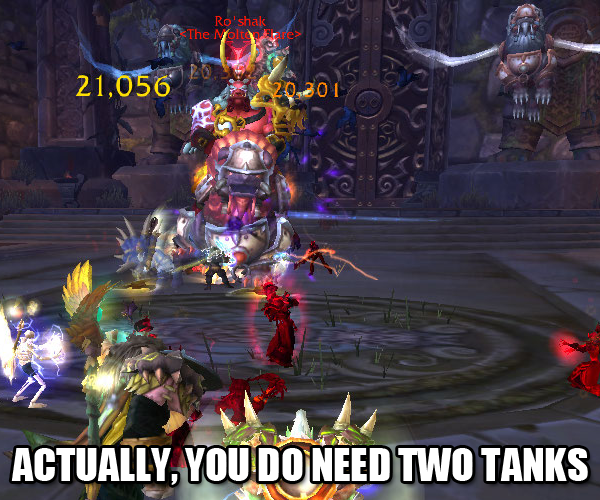 We queued again to bring in another tank because duh, but one did not appear. People became impatient and charged Qon JUST BECAUSE. Unfortunately, the LFR queue thinger stops completely while you are in combat, which meant that finding another tank took even longer, which in turn meant people became even more impatient, even after we wiped. If you get enough stacks of Determination, it doesn’t matter whether you have two tanks or not LOLRITE? It was like a circular reference in Excel, just with higher repair costs. While I’m speaking of going in circles, OH MY GAWD WHY ARE THERE MORE TORNADOS HAAALLPPP! Oh wait, these just stun you? I guess that’s fine, then. Is there a button for this? I’m stuck in a tornado and I can’t get out! Just no. No. Stahp. Shut up. Fin. End. Over. STOP. Fortunately for all concerned, a tank pulled at the exact moment a friend called, and DPSing with one hand while holding the phone in the other left very few fingers available for typing in all caps. 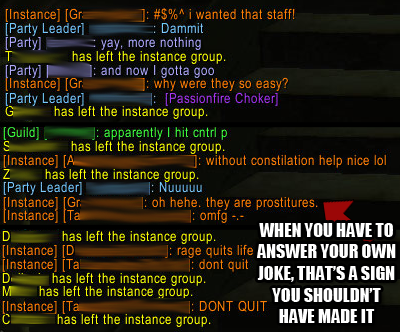 Fortunately for ME (since I don’t particularly feel like arguing with almost all of a LFR group), all the capslock I committed was to my party itself, not the instance chat. Learning from your mistakes is smart. Har har har. 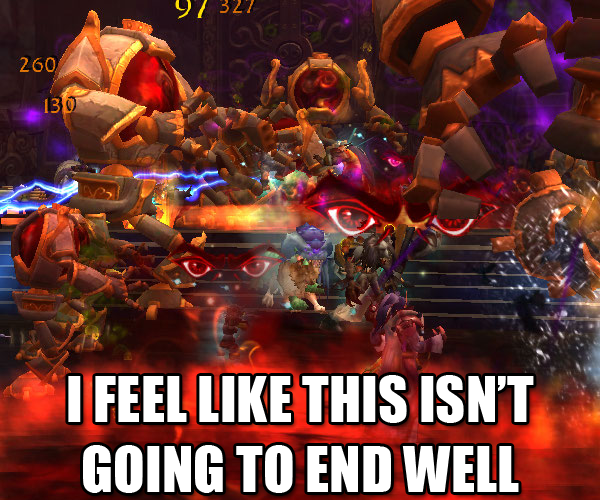 C’mon, people, I know it’s LFR, but you can do better than that. 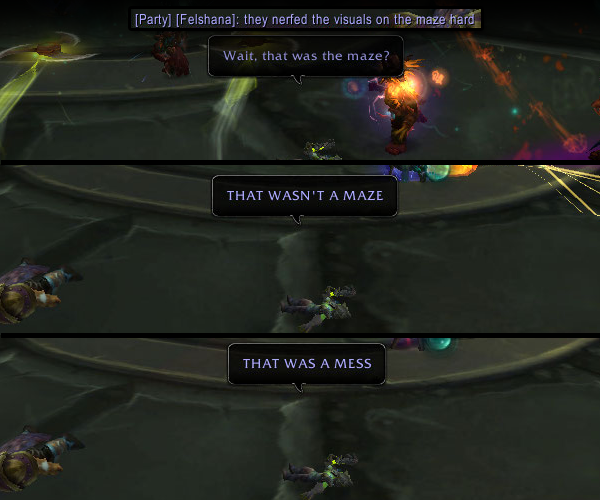 I was feeling generally irritated by this point, and in addition had been informed by multiple screaming people that Lei Shen or Mr. Thunduar or whatever his name is actually requires coordination and sheeyit that is all but impossible with the random nature of a LFR group. Has Durumu taught us nothing? THERE’S NO WAY, THERE’S JUST NO WAY. So I left. I’m gonna wait for him to get nerfed, and I’m clearly not the only one with that plan. Speaking of, I somehow feel as though Pandaland’s point itself got nerfed with this dude and the Zandalari. Yes, it’s a nice, neat little turn of story for a people who got effed over by the Cataclysm to fight the hell back against the world by resurrecting a dead guy. It’s just that I read so much crap about how the plot and the bosses of Pandaria were different, because they weren’t some Obvious Other. No, they were the Sha, and the Sha are actually ourselves, our own negativity and our own overpowering strength. Face yourself! And now you get a burly half naked dude with control over thunder? Bah. This entry was posted in For the Horde, Baby!, Goblins, OMGWTF, Thermalix, World of Warcraft and tagged /omg, death and destruction, goblins, hunter, iron qon, lfr, maybe someday will be better, oh the goblinity, pinnacle of storms, run awaaaaay, thermalix, twin consorts, world of warcraft on April 19, 2013 by Prinnie Powah. I have heard a crapton (yes, a crapton) of bad things about Durumu, whom I deemed “the Soul Crusher” for his ability to wipe LFR groups over and over and over again. If it wasn’t someone complaining or flat out losing their mind, it was their DBM addon telling me that they wiped for the nth time. I was told it got nerfed. I was told it was still fatally terrifying. I finally decided that I really ought to try it, though not for the ranged weapon (which of course didn’t drop) – no, I was gonna do this for JOURNALISM blogging. Anything supposedly so catastrophic was going to be GREAT in the worst possible way. Are There Snails In Here? They gave me nightmares last time. Although friends kept trying to explain the mechanics (beams of light, maze, death) to me, I had to first make sure we weren’t going to get ambushed by any murderous gastropods. SOMEBODY has to think of these things. 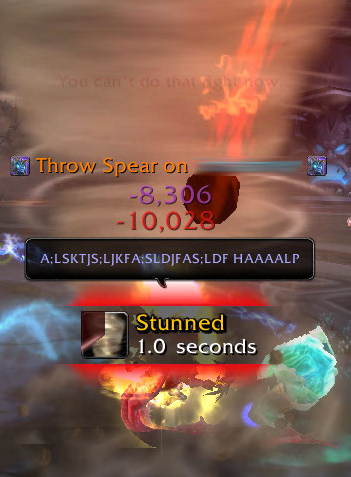 Since the Halls of Flesh-Shaping part of LFR has been out since the 2nd, I was a little startled to find that there were still other people who had no freaking clue what they were doing. I don’t know why. You’d think I’d know by now that I have no monopoly on ignorance. Note to self: if I ever tank this, keep this information to myself no matter how true it is. I guess it’s good that he was honest? As a side note, I’ve always been taught never to admit this sort of stuff – you don’t want to draw attention to yourself, especially if that attention is going to be the “OMFG YOU FAIL AND YOU KILLED US ALL” kind. After removing all the trash, the legend himself appeared. I rather like his little hat. Even eyeballs with tentacles and dental problems need good hats. Twenty pots of coffee ought to do it. 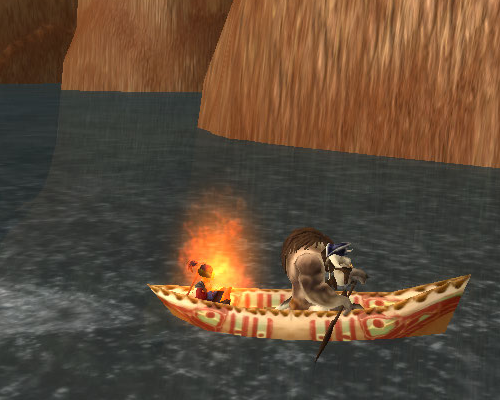 Initially, I tried to remember all the floating eye type bosses in the Legend of Zelda series who resembled Durumu. After giving up on that exercise, I mentally prepped myself to run through some sort of maze – I was thinking walls, rats, running back and forth as I bounced off dead ends, etc. I also wondered if, somehow, the encounter would show that Blizzard designers were taking the whole trapped-like-rats-in-a-maze thing a bit far. At first there were just some beams of light rotating around in different primary colors. These supposedly reveal adds, but I never actually saw the adds myself, possibly because I was too busy trying to keep an eye out for the maze thing. I DID think about making a color wheel joke right about here, but decided to pass on the opportunity. Then came the bad. GTFO told me I was standing in bad. DBM also informed me that I needed to move. I was already going because OMFG OW OW OW OW OW OH CRAP, but it didn’t make a damn bit of difference – there wasn’t anywhere to go to that wasn’t bad. ANYWHERE NEAR ME WAS BAD. The bad hurt like hell, too, so I didn’t succeed in finding a safe place. There were a few differences, of course. 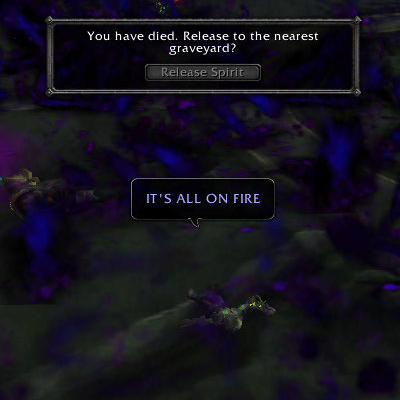 There weren’t any Aspects to complain while we were the ones being burned alive, but they were more than adequately replaced by fellow members of the LFR group who couldn’t seem to believe that people would actually DIE after having used a health stone and a potion. 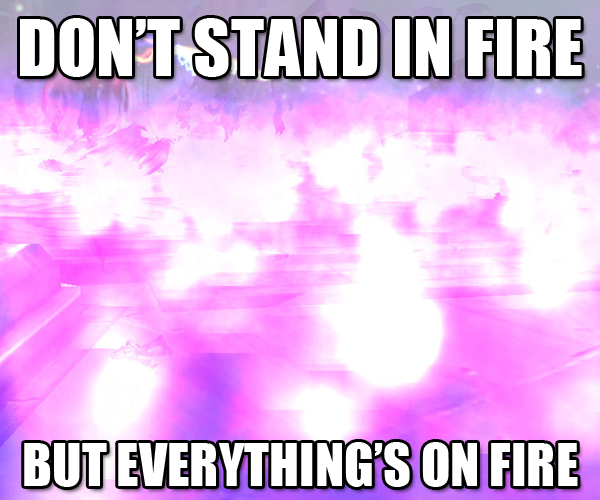 The Dragonsoul fire-fire was easier to avoid while there was space to do so. And we may have been getting torched by magical dragon breath, but it didn’t hurt quite as much as the nasty dark purple stuff in the Halls. Lastly, the fire had no pretensions of being a maze. 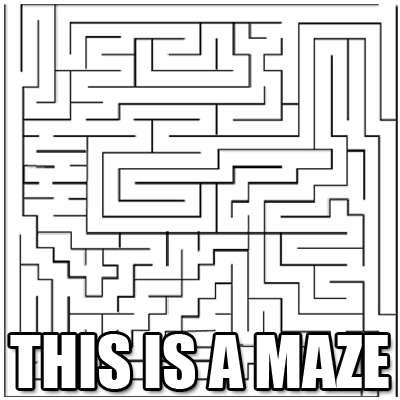 Let’s take a moment to discuss what a maze is. They are puzzles! Challenges! 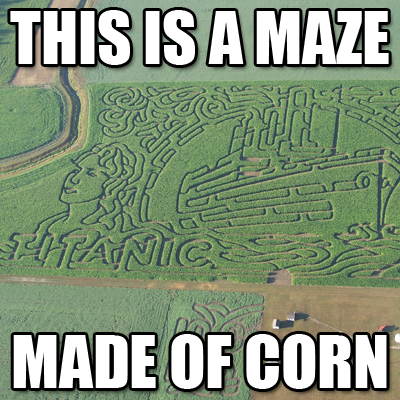 Mazes have many paths to choose from that may take you to the end or take you nowhere at all. Note that word: CHOOSE. You can’t choose when you’re dead. But possibly some sick, twisted vision of one. Found the clear spot? Good for you. 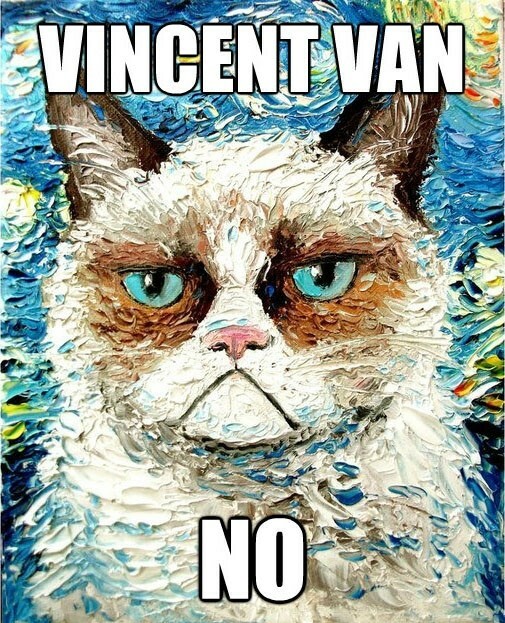 Now die. I’m TOLD that the opening starts to the left or the right of the boss, but the thing is, if you AREN’T ALREADY THERE or aren’t EXTREMELY close, you’re effed. And sometimes if you are there – I did find the clear space once by accident – you’re effed anyway. Let’s say you live, though. You aren’t really in a maze so much as you’re following something you can’t see and praying to Gawd the opening it leaves doesn’t vanish on you because you got a little too far behind. If it does, YOU DIE. Thanks to the nerfing and the fancy buff you get for failing, we only wiped two or three times. I’d argue that we call a spade a spade though. This is a hot mess and needs more nerf. Either make the bad do less damage, make it the bad appear more slowly so you have time to escape it, and/or make the safe spot more obvious. Think General Erudax in Grim Batol, where a glowy swirly shows you where it’s safe to stand. You’ve got a handful of seconds to get there while he casts, but if you don’t QUITE make it, you still have more than a few seconds of life to try. You aren’t effed unless you’re on the far side of the room, half dead already or just really lost and confused. 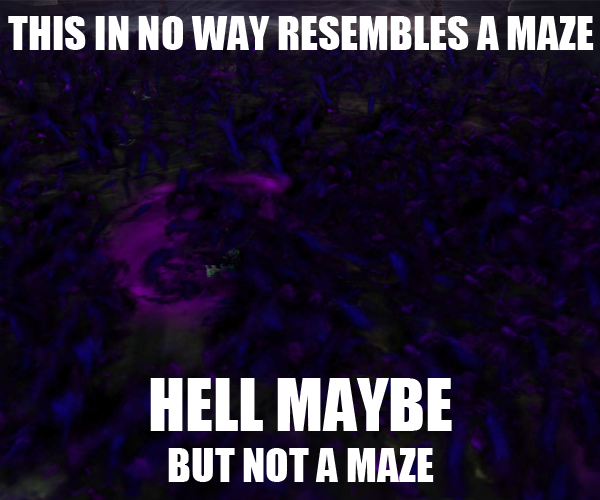 Above all, we should not call this sheeyit a maze, because it ain’t. Primordius was fun, although he made me sad because he was in pain. Obviously, he’s kind of S.O.L. in any number of ways, including being second in line after Durumu. I’d say about one tenth of my brain was focused on Primordius, while eight tenths were still screaming OMGWFTNOTAMAZE and the final one tenth was wondering if I got any good screenshots of Durumu. Dark Animus was TACTICS EL OH EL WTF GUYS UM OK. p.s., running through the raid with this red sheeyit on your tail is an easy way to irritate others, even if it is fatal. In my lame defense, I thought the red sheeyit was only going to hurt me, not everybody else. (Therefore, if I got out of the raid’s general vicinity, it didn’t matter how I got there.) Oops? This entry was posted in For the Horde, Baby!, Goblins, OMGWTF, Thermalix, World of Warcraft and tagged /omg, escape from durnholde, gawd help me, goblins, halls of flesh-shaping, hunter, lfr, maybe someday will be better, oh the goblinity, thermalix, world of warcraft on April 13, 2013 by Prinnie Powah.